Bijou Lovely: New Items in the Shop! 6 New Items in the Shop! I'm really excited to share a little project I've been working on lately! I've decided to make a few new items for my shop. I've been on the hunt for a pretty knitting gauge and thread organizer. I wanted something modern and also something that would look pretty in photos if I'm using it with my projects. Call me superficial but beautiful things are important to me! :) Anyway, I have a few different items in the works, but the first ones just came back and I am in love! First up, a pretty little knitting gauge! 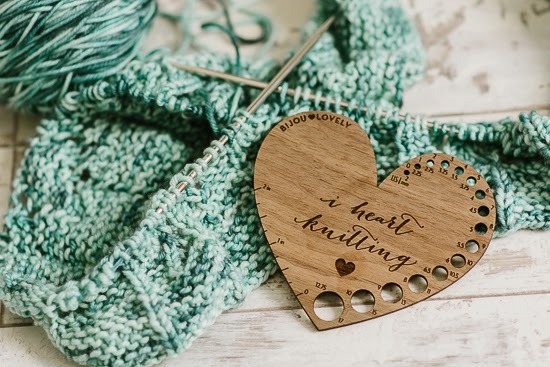 The knitting gauge is engraved with "i heart knitting" and a little heart. It has needle sizes 0-17, along with a ruler to check gauge on your swatches. 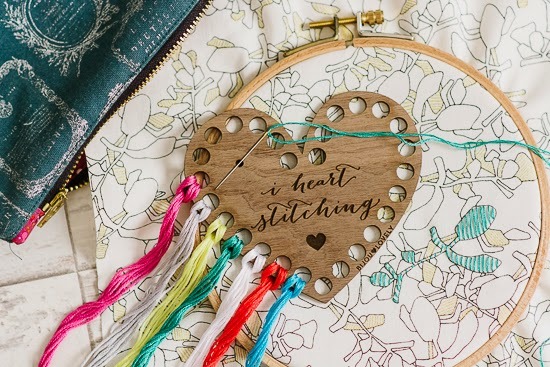 Next, a thread organizer and needle minder to keep track of all your embroidery floss and needle during your stitching projects! 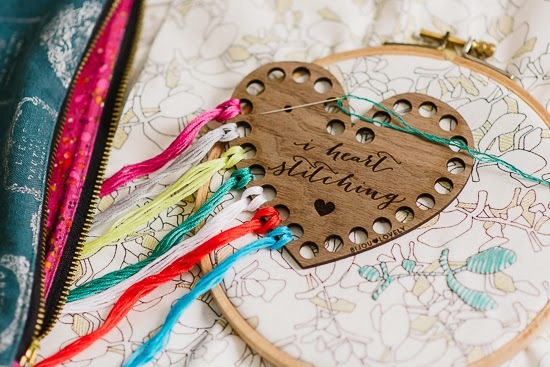 Great for cross stitch, embroidery, hand quilting, etc. 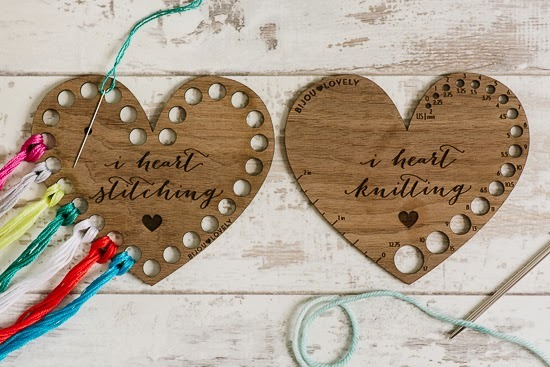 Engraved with "i heart stitching" and the same cute heart design. There are 27 holes to keep your floss colors organized, and a little magnet to keep your needle in place when you're not using it. Both designs are laser cut and engraved into 1/8" thick walnut. I think I'll be hand waxing them too to give them a bit of shine. They are available for pre-order in my shop now! $14 each, or get both for $25! They will ship by the end of April at the latest. I only have US shipping options listed at the moment, but if you're international please send me a message and I will give you a shipping quote! Aren't these the cutest gadgets ever!